TBILISI, DFWatch–Two mine workers were injured Thursday as result of an accident at a manganese mine in Chiatura, a town in western Georgia. 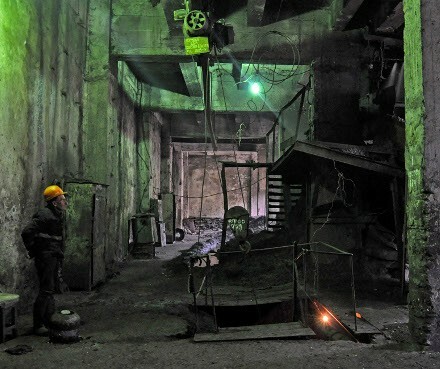 According to Tamaz Dolaberidze, head of the mining and metallurgical workers’ trade union, the accident took place at about 14:00 in the so-called Stalin mine. Zurab Gamezardashvili (26) lost his sight on both eyes, while Tariel Bitsadze (50) lost his sight one one eye. The reason for the accident is unknown, but the trade union demands to set up a commission to find out what happened and ask for the labor union to be represented in that commission. The two injured workers have been taken to a hospital in Tbilisi. A spokesperson for Georgian Manganese, which owns the mines in Chiatura, told Rustavi 2 that the accident happened during blasting work to extract ore in a closed down mine. Trade union representatives believe that security rules were violated, which is not uncommon in the Chiatura mines. The Interior Ministry said an investigation has been launched for violation of security rules. This happens every time there are accidents in Chiatura, but the cases almost never result in the case being solved or anyone being punished. The Georgian labor inspection was closed down by former President Saakashvili in 2006 due to corruption, and no new agency was created to fill its role. The Georgian Dream coalition, which has been in government since 2012, promised to reintroduce the labor inspection, which was also a requirement under the association agreement Georgia signed with the EU last year. Despite this, a new labor inspection has not been created. There are inspectors monitoring work conditions, employed in a department at the Health Ministry, but they do not have the authority to issue fines or take other measures against employers who violate the rules; they can only issue recommendations. In addition, these inspectors need to be invited to carry out an inspection. The Health Ministry claims inspectors are being trained who in the future will become labor inspectors, but it would require amending many laws for Georgia to have a proper labor inspection.